Domestic calculations may ensure that Vietnam’s response to this latest South China Sea clash is robust. Once again, China has clashed with Vietnam in waters claimed by both countries. The disputes over the South China Sea have become something of a soap opera: Chinese and Vietnamese ships collide, Chinese or Filipino fishermen are hurt or missing, the Chinese deny the aggression, the international community condemns the action and calls for restraint…We’ve heard it all before. And also once again on the eve of an ASEAN Summit, China has tested Southeast Asian unity. This time the hot potato has been thrown at Naypyidaw to chair the – now very anxious – summit. Given the history and the style of ASEAN, it is only reasonable to expect the mantra of “consultations and consensus,” calls for peaceful resolution of disputes, and non-legally binding decisions over the difficult issues. The question is whether there will be a repetition of what happened in Phnom Penh in 2012, when Cambodia was ASEAN Chair and the organization was unable to issue a joint communiqué because of differences over the South China Sea. This has since been seen as a clear indication of the influence China has over Cambodia. Over this weekend we will learn if Myanmar has a firmer say. But neither the maritime disputes nor the inability of ASEAN to address them are new. So why should we pay any attention this time? Because this time, the clash has the potential to challenge the region’s peace and stability, those conditions that ASEAN has been so proud of since its inception in 1967. It could challenge the credibility and the mandate of the Association if it is unable or unwilling to take a firm stand. Beijing’s objective of challenging ASEAN is clear, but was it also trying to send a message to Washington by timing the clash a few days after Obama’s visit to the region? Have Russian actions in Crimea emboldened China? The timing is indeed relevant for this “episode.” For Vietnam, which is living under the continuous threat of Chinese invasion, a series of important dates may well influence the reaction to this provocation. For the last few weeks Vietnam has been in a festive mood, marking some important national days: April 30, the anniversary of the 1975 unification of north and south, and May 7, – the 60th anniversary of victory at Dien Bien Phu. May 1 and Vesak Day on May 13 round out the celebrations. The nation has been enjoying a burst of nationalistic pride. That emotion will not determine how this crisis is resolved, but it should not be underestimated. The Chinese action hit at the crest of a nationalistic wave. Media and social media on both sides are adding oil to the fire. With the Chinese media talking about giving Vietnam a “lesson it deserves,” the anti-Chinese response in Vietnam has been significant. Leadership decisions are also affected by these popular moods. The recent arrest of bloggers Nguyen Huu Vinh aka Ba Sam and Nguyen Thi Minh Thuy has raised public discontent and sparked growing criticism against the government. Ba Sam, a political activist, started a blog in 2007 as a forum to promote freedom of information. He and his collaborator Thuy were arrested on May 5 under Article 258 of the Penal Code. The Vietnamese regime is concerned about its stability. Internal jostling weakens its legitimacy. Threats of sovereignty can be a helpful source of legitimacy. Social discontent can be redirected at another target. 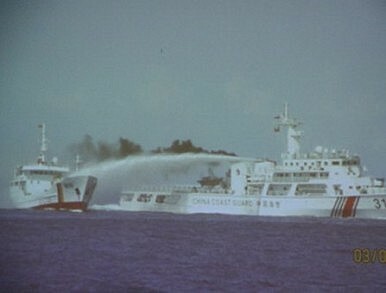 Chinese action in the Paracel Islands takes hold of public attention and redirects it at an external threat. This weekend, it is likely that Vietnamese Prime Minister Nguyen Tan Dung will take the stage at the ASEAN Summit and be at least as vocal as he was at the Shangri-la Dialogue keynote speech in 2013. In the meantime, the Vietnamese public may also make their feelings about China felt. Nationalistic sentiment, if skillfully managed, could be used to sustain the Vietnamese regime. For that reason, Hanoi is likely to be uncompromising in its response this time. As the deputy commander of the Vietnamese Coast Guard said in reference to the Chinese pattern of provocative behavior: “Every restraint has its limit.” But the question that remains, and may perhaps be answered over the weekend, is this: What are the limits for the other actors in the Asia-Pacific region? Huong Le Thu is visiting researcher at the Institute of Southeast Asian Studies, Singapore.